Few teams were as interested as the Pittsburgh Penguins' front offices were in this week's NHL Board of Governors meetings. Yet, the Pens interest in the meetings at Pebble Beach, California had little to do with the drama surrounding the Thornton/Orpik fiasco. Rather, one integral topic that was being covered had the potential to affect the immediate futures of over half of the league's franchises: the salary cap. Following the annual conference, NHL Commissioner Gary Bettman - incidentally celebrating his 21st year as Commish this past week - announced that the hard cap, per the NHL and NHLPA's Collective Bargaining Agreement, would be increasing more than 10% for the 2014-15 NHL season. This increase would see the cap jump from $64.3 million to the $71.1 million projected by the League. For several teams, this increase could drastically affect moves made at the deadline, as much as moves made going into next season. The Penguins fall into that category with large increases in salary due to both Evgeni Malkin and Kris Letang in the upcoming season. Currently, the Penguins are set to spend $55.9 million dollars against next year's cap. At the current cap, that would allow them to spend a mere $7.4 million dollars in new contracts. With only 15 players under contract through at least the 2014-15 season, that small amount of money would burn up pretty quickly and leave huge holes that make this season's lack of depth look minor. The $15.2 million of space left under the new cap should go a long way towards avoiding any major issues. Until somebody begins overpaying in the free agent market, at least. In the meantime, here's a list of the Pens who are facing Free Agency and what you can expect out of the market as a result of the increased cap. Jokinen and his $2.1M cap hit....okay, his $1.2M cap hit....for the Pens is likely to not go up at all. Of course, it won't go down either. He is still an excellent veteran presence at forward. His forechecking remains top-notch even though his puck-handling is suspect more times than not. Glass has quietly been one of the pleasant surprises this season. At the beginning of the hockey year, it would have been difficult finding someone not willing to ship him and his $1.1M contract elsewhere. His worth to the team has increased and, thus, his asking price will as well. Look for somebody - whether the Penguins or some other team - to pay him close to $1.5 or $1.75M. Having spent most of this season on the shelf, it's tough to get a read on where Kobasew stands with the Pens. In the preseason, he was lights out, clearly earning his spot on the Pens roster. In the games that he has played in the regular season, he's been largely unremarkable. I would classify Chuck "I'm Chuck Kobasew, Steiggy, Not Jarome Iginla" Kobasew as an expendable resource for Pittsburgh at this point. Either by trade or through the expiration of his contract, unless he earns his way back, look for his stay in Pittsburgh to be a "one and done." The St. Louis native shows flashes of brilliance at times and his youth at other times. His speed is a definite plus. So far this season, he's spent more time up in The Bigs than he has in the AHL. Presently, his is a $550K contract that will undoubtedly go up after this season, especially if he continues his marked development. Since his hit will remain under $800K, look for him to remain a Penguin. Chris Conner is a victim of genetics. In a world filled with 6'4" athletes, his 5'8" frame does absolutely nothing to help him. It's unfortunate for him that tenacity can only go so far. If Conner is a Penguin after this season, it will still be at that league minimum level. In 2014, Brooks Orpik will be a Penguin. Fortunately for the Penguins he will be in 2015 as well. The Pens will do what it takes to keep "Brooksy," short of naming him captain. Due to his recent injury at the hands of Shawn Thornton, how much he gets could depend on his recovery. If his recovery is rapid and he shows no ill-effects, his $3.75 will increase dramatically as one of the best defensive defensemen in the league. The longer he's out, the less he will get, but look for Orpik to land a best-case $4 to $4.5 million contract. As Sean Griffin told us just this week here on PensInitiative.com, Niskanen could very well go down as the best trade that Ray Shero didn't make. It's pretty much an undeniable fact that he and his $2.3 million contract placed him at the top of the "Pens Most Likely To Be Moved To Make Cap Room" list of every observer of the team. He has proven himself to be a more than capable defender, worthy of a Top 4 label. Unfortunately for Nisky, and maybe the Pens, he will attract a lot of attention in the free agent market. His $2.3 million will likely bump up considerably. For that reason, barring significant long-term injuries to the defensive corps, he could be dealt still, if only to minimize the loss felt by the Pens. For the role he plays and the versatility he's shown, Deryk Engelland has been a steal for the Penguins. He has played defense. He's played on the wing. He's been the enforcer. And all for barely more than the league minimum. Some teams may come calling via free agency but reality remains the same: Engelland will continue to make far less than $1.0 million each year and could still provide grit and, more importantly, options for the Pens down the road. Or a young team looking for that same type of player could come along and get a decent deal on a quality 18th skater. What can be said about Tomas? He's a great guy. A great teammate. And, after his latest bout with DVT, staring down retirement. Certainly not by choice, however. 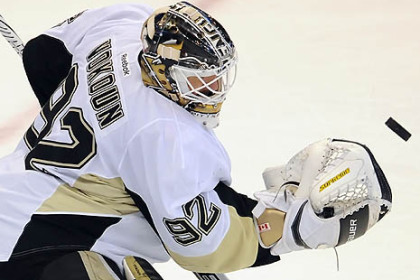 That said, it is possible that Vokoun returns for another season, if only to "go out on his own terms." That would be a best case scenario for the Pens and they could expect to pay his current salary of $2 million or perhaps a little less. Of course, the Pens may not be interested given a younger option that has emerged in the organization. When it was announced that Tomas Vokoun was out indefinitely with blood clots in his hip, 21 year old Jeff Zatkoff was thrust into the backup role. That development was met with much apprehension. When he made his regular season debut in a 3-6 loss to the lowly Florida Panthers, that apprehension turned into something much worse. Since then, the rookie out of Miami (OH) University has shined, increasing his value with every appearance. While he's not ready for his big money contract quite yet, the Pens will want to lock him up and it may cost them $1 million or so to do just that. Since being acquired from the Carolina Hurricanes in exchange for Jordan Staal, nobody has been treated as unfairly as Sutter. Many fans expected him to be as good or better than Staal. That's a lofty expectation and one that never should have been saddled on him. Sutter is good in his own rite, to be sure. His game is just different than Staal's is/was. 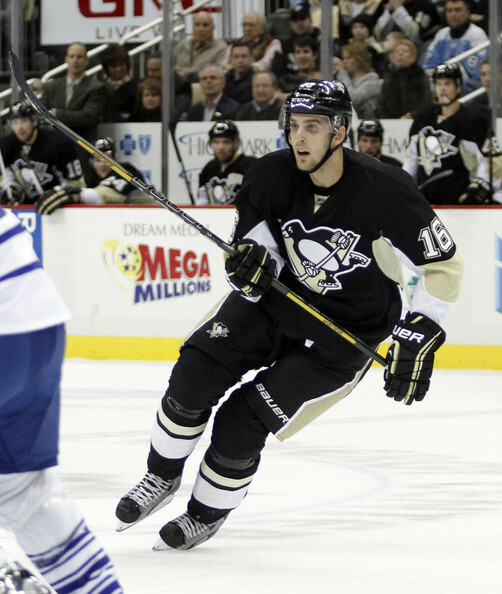 As such, Brandon Sutter is an excellent third line center, has decent speed and is dependable in his own zone. Offers will be made for his services and the Penguins will match. Look for him to get a decent raise to about $2.5 million. Jayson Megna is another young player who, thanks to injuries and a lack of depth at the forward position, has had an excellent opportunity to showcase himself. His performance has impressed many and should garner him many offers from teams looking to add youngsters with great offensive instinct and a hunger for the game. Megna is that type of forward, showing great potential at only 23 years of age. Megna is another player the Pens will likely match offers for should another team attempt to sign him. Sill's worth to the team is much the same as Deryk Engelland. While Sill is explicitly a forward, his job is to agitate and be physical. His weakness seems to come with the lack of offensive ability. Look for him to become an unrestricted free agent barring any developments over the next few months. Adding to the depth of the Pens defensive corps, Despres' fate with the team could hinge on the status of Matt Niskanen. If the Pens re-sign Niskanen, look for Despres to be shopped. But if the Pens do decide to cash in their chips with Nisky in the form of a trade, Despres will most certainly be re-signed himself. At 22, the young defenseman will probably receive offers in the $1.5 to $2 million range - a decent bump from the $840K that he currently accounts for. All in all, the bump in the salary cap should give the Pens at least a little bit of breathing room for maneuvering in the upcoming NHL season given the big money they'll be paying Evgeni Malkin, Sidney Crosby, Kris Letang and company. Couple that small amount of relief with the surprising development of many youngsters within the organization and the prospects for the team's long term future look to be quite good.